I try to understand what consequences double spending may have. Let's assume I own 51% of the network and own three bitcoins wallets. If I double spend the coins from Wallet A to B and C - would I have doubled my coins? I know that they are not really doubled, but if no one would noticed, would I be able to e.g. send them to Coinbase wallet and convert the double amount to USD? If not, how does an attacker actually make money from a double spending? Double spending is not about doubling, but about using the same UTXO twice. So, you won't gain anything by double spending coins to yourself. Lets Alice be an attacker trying to double spend some coins. Alice goes to Bob's store to buy some goods. In order to pay for the goods, she create a transaction, TX1, that spends from an UTXO from a previous transaction, TX0, and pays to Bob. Later on, Alice generates a second transaction, TX2, that also spends from TX0 but this time pays back all the money to herself. Down bellow you can see the scenario depicted. 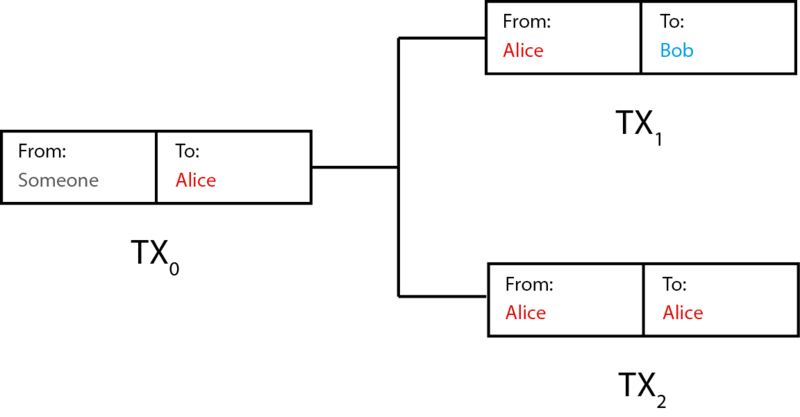 Now, Alice has multiples ways of double-spending the transaction, depending on her hash power and on whether TX1 has been included in the blockchain or not. Since you assumed you have a 51% of the network hash power, we can assume that Alice can mine a block with a greater probability than anyone else, so we will take it for granted, an analyze only the other factor, what happens with TX1. If we assume that TX1 is still not confirmed, but it has been broadcast and the nodes are aware of it, Alice can double spend TX1 with TX2 by just including TX2 in the next block she mines. If Bob has accepted the zero-confirmation transaction as a payment and has delivered the good to Alice before the inclusion of TX1 in the blockchain, Alice will obtain both the goods and the double-spent amount. If TX1 gets confirmed, either because, against the odds, another miner has mined a block in which the transaction was included before Alice mined hers, since Alice has the greater hash rate she can overcome the previous block by continue mining on the top of the previous block. This will create a blockchain fork, and eventually Alice branch will be longer than the other, since her hash rate is bigger. Notice that if Alice does that frequently lots of forks will occur, in which double-spending transaction could be identified, what will undermine the trust on the currency. Last, being Alice the most powerful miner, she could just include double-spending transaction without forking the chain, by including a TX2 in the same branch than TX1 was included. Notice that this violates the blockchain inclusion rules, since two transactions can not spend from the same source. Therefore, the rest of the network will not accept this block as valid. However, since Alice has the greater hash power she can just keep going and mine over that block. In this case two things can happen, either the trust in the currency is lost since more of the 51% of the hash power is devoted to cheating, or the branch that includes both transactions is just ignored by the rest of the network. In conclusion, no good comes from someone controlling such amount of hash power.